When the show’s co-host Guy Raz came to James’s hometown this summer for a live taping of his podcast for grown-ups, “How I Built This,” James’s mom arranged for them to meet outside the venue. James had Mr. Raz sign the back of his NPR T-shirt. As podcast makers look to expand their audience — just under a quarter of Americans have listened to a podcast in the past month — they’re turning to a previously untapped demographic: children. The public radio tradition that’s powered the recent podcast boom never invested much in children’s audio. But now that podcasting has allowed for endless shows on demand, audio makers are eager to get their content straight to children’s ears. And the technology that made podcasts possible — the smartphone — has also gifted its producers a golden sales pitch: Podcasts are being pushed as a guilt-free alternative to screen time, a more engaging option than zoned-out YouTube bingeing or hypnotizing mobile games. The market is suddenly bustling. This month, the podcast network Panoplyintroduces a subscription app for kids, Pinna, which offers a digital toy box full of ad-free audio for listeners 4 to 12. (“Pinna” is an anatomical term for the external part of the ear.) Gen-Z Media, a new youth-focused production company from the people who made last year’s out-of-left-field kids’ hit, “The Unexplainable Disappearance of Mars Patel,” is cooking up a suite of new scripted podcasts for children. There’s even an advocacy organization, Kids Listen, which lobbies for more and better content for children. And the first kid podcast stars are on the rise: “The Show About Science” features Nate Butkus, a 7-year-old host who can’t pronounce his Ls or Rs but holds his own in interviews with scientists about their research. Getting kids to listen in, though, is harder than it sounds. Podcast makers are trying to create an entirely new form — one that needs to train kids and parents to follow entirely new family traditions. Sticking a kid in front of the morning cartoons may carry a whiff of stigma now, but it’s just as easy as it ever was. Also, it’s free. Partly because children’s podcast creators are claiming the moral high ground on screen time, advertising is controversial for the medium. Pinna is charging $7.99 a month for its ad-free offerings. Whether parents will pay up remains to be seen. Andy Bowers, Panoply’s chief content officer, has been puzzling over how to turn children’s audio into a sustainable enterprise for a couple of decades. Before he created Slate’s podcast network and spun it off into its own business, Panoply, he spent 17 years in public radio, where he tried unsuccessfully to evangelize for kids’ programming. The conventional wisdom for radio stations was to stick with just one format — music or news. Producers were loath to abandon their dedicated adult audiences and try to wrangle children in front of the radio for an hour a day. So in 2005, just as the podcast was emerging as a form, Mr. Bowers started his own homemade kids’ show with his 5-year-old daughter, Emma, taping episodes in a closet of their house. “Molly and the Sugar Monster” is a charming a bit of reverse psychology: It features Mr. Bowers as an ornery monster who urges kids to eat junk food, and Emma as a wily kid who taunts him with tales of her vegetable consumption until he explodes in frustration. Now the series has found a home on Pinna, where it’s been packaged along with a trove of exclusive audio content. Emma Bowers, now 17, collaborated with Mr. Bowers on an original “sound picture book” for the app, “Kid Wash,” which used a binaural recording system — a mold of a human head outfitted with microphones — to create a 3-D listening experience that feels unlike anything children can read or watch. Nonfiction content includes the kid’s trivia game show “ExtraBLURT,” the sports talk show “Good Sport!” and “The Show About Science.” Come November, Pinna will debut a choose-your-own-adventure podcast and, in December, a series styled like an advent calendar, with an episode dropping each day leading up to Christmas. Podcasts creators aren’t just selling content; they’re pitching a lifestyle shift. “Because kids weren’t valued as an audience in radio, I think there’s an assumption that kids don’t listen to audio, or they can’t stay engaged by it,” said Lindsay Patterson, co-chair of Kids Listen and the host of the children’s science podcast Tumble. 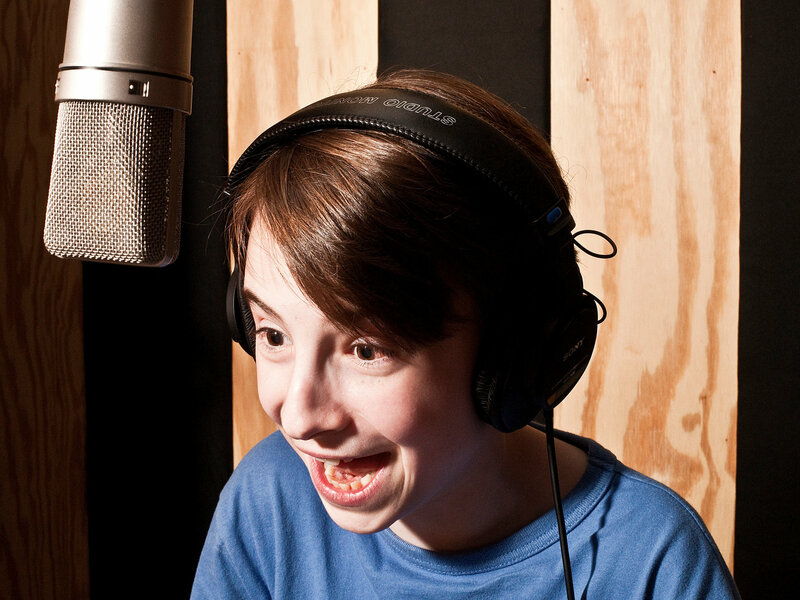 Even NPR’s first podcast for kids, “Wow in the World,” was personally financed by its hosts, Mr. Raz and Mindy Thomas, who record the show on nights and weekends in Ms. Thomas’s basement studio in Fairfax, Va. (It’s paid off: Since its launch in May, “Wow and the World” has sat at the top of podcast rankings for kid and family content, racking up more than 3.6 million downloads.) “The Unexplainable Disappearance of Mars Patel,” which debuted last year, was the “Serial” of children’s podcasts and proved that serialized audio narratives could catch on among younger audiences. But unlike with YouTube channels or mobile games, children don’t yet have an easy way to discover podcasts on their own. Even the “Kids & Family” section of iTunes is peppered with often-inappropriate content for couples and parents. Dedicated apps for children’s podcasts — in addition to Pinna, Kids Listen offers its own appfor surfacing children’s content, as does a new app called Leela Kids — seeks to streamline that discovery process. “Four-year-olds, these days, will be very fluent in their use of the app,” Ms. Shapiro said. Partly because kids’ podcasts are trying to situate themselves as a more virtuous alternative to screen time, advertising to kids is a sticky issue. In the grown-up world, podcasters typically appeal to advertisers with boundless editorial flexibility; marketing pitches are often written, produced and performed by the hosts themselves. On “Wow in the World,” Mr. Raz and Ms. Thomas have opted to aim commercials at the parents who are listening in. Before a break, a child’s voice announces: “Grown-ups, this message is for you,” and then an adult voice-over artist reads ads for parent stuff like a meal-kit service or a sock start-up. Meanwhile, Panoply is hoping that parents will pay $7.99 a month for the ad-free Pinna. “I just think it’s coercive,” said Mr. Bowers of advertising to kids. To reach a broader audience, Pinna will also offer select episodes of its shows for free; those won’t have ads, either. If podcasters manage to capture the kids’ market, they stand to create podcast listeners for life. James Kee, the 7-year-old fan of “Wow in the World”, has already started branching out to more advanced fare. “I’ve listened to a little bit of ‘Pod Save America,’” he said. 25 Fitness Quotes That'll Make You Say, "Yaass!"